For construction information managers, PlotWorks Pro is a production workflow solution that streamlines your digital printing and scanning operations.﻿ Unlike manufacturers' controllers, PlotWorks provides a common platform for simultaneous, centralized control of multiple printers, scanners and finishing devices from a variety of manufacturers. PlotWorks Pro is the premier platform for the management, production, and distributtion of construction documents. Whether color or monochrome, digital or hardcopy, PlotWorks Pro will help you get the right information to the right people at the right time. With integrated track-and-trace you can provide the transparency and accountability that your customers expect. As a vendor-neutral platform, PlotWorks Pro supports color and monochrome printers from all of the leading manufacturers including Canon, HP, KIP, Océ, and Xerox. With both direct and indirect communication protocols, finishing devices from Bay, ES-TE, Gera, and Tameran are also supported. We chose to build our production workflow on OpCenter's products because we believe OpCenter has solid technology, they are hardware vendor independent, and are innovating aggressively. Adoption of this technology is critical to us competing in today's fast moving business environment. Improving workflow means removing production bottlenecks and improving efficiency. PlotWorks does both by connecting all of your wide-format systems, greatly improving the utilization of each device. Increased utilization translates to greater return. By increasing the capacity of each device, you will complete your jobs more quickly with less equipment. 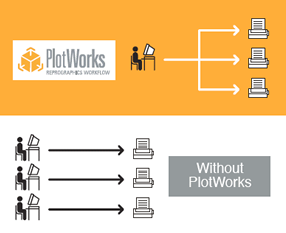 PlotWorks can drive multiple printers from a single workstation, reducing your labor costs. With PlotWorks tying all of your devices together you now have the freedom to choose scanners or printers from a variety of manufacturers. Devices with high service costs can now be replaced without negatively affecting workflow. The powerful job control and queue management features of PlotWorks allow you to complete work more quickly, enhancing customer service. For example, the ability to interrupt or redirect print jobs without reprinting enables you to immediately satisfy walk-in customers without significantly delaying jobs in progress. 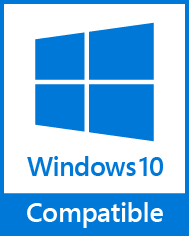 Proprietary file formats. OpCenter neither develops nor promotes proprietary file formats for the storage or transfer of data between you and your customers. PlotWorks supports open, published standards such as DWF, PDF, TIFF and HP-GL. Single vendor dependence. By allowing you to mix and match printers and scanners from multiple vendors, PlotWorks will reduce your dependence on any single vendor. Specialization. By providing one consistent software interface for all devices your operators will require less specialized knowledge. When an operator is unavailable any other operator can fill the void.